Our comprehensive coverage of the fan-favorite Marvel Studios films and Marvel Television series rolls on! This issue shines a spotlight on the Hulk’s gamma-charged feature film! 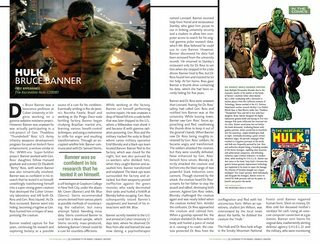 With fact sheets, movie-to-comic comparisons, behind-the-scenes art and production stills, this issue features profiles of the ever-incredible Hulk – plus this future Avengers’ friends and family including Betty Ross, Samuel Sterns, and enemies including Abomination, Thunderbolt Ross and more! Relive the big-screen thrills of 2008’s The Incredible Hulk!